The J. Grotto Series is one of two cigar blends made by indie cigar maker, Ocean State Cigars. Ocean State Cigars was founded by Paul Joyal. The J. Grotto Series (along with its sibling blend, the J. Grotto Series Reserve) are manufactured in Honduras, and have a significant proportion of Honduran tobacco in their blends. In my opinion, I felt Honduran tobacco made a nice renaissance in 2011. 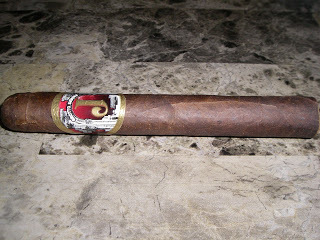 However, most of the recent resurgent primarily Honduran blends have been made by the medium to larger cigar companies. I was very curious to see what this indie company could do. After smoking a couple of samples of the J. Grotto Series, I must say the initial impressions of this cigar maker have been positive. I will admit, I have not seen Ocean State Cigars’ as right now there is not a presence in the southeast. The company recently issued a press release indicating they are launching a national ad campaign and increasing their sales force. Prior to this campaign, much of Ocean State’s activity had been based in the Northeast part of the U.S.
Let’s break down the J. Grotto Series cigar in more detail and see what this cigar brings to the table. As mentioned in the introduction, the J. Grotto Series is primarily a Honduran blend. The Honduran tobacco is grown in the Trojes region of Honduras. When the tobacco is harvested, it is aged for a minimum of three years. For my smoking experience, I went with the Gran Toro size (which in my mind, this actually resembled more of a classic toro vitola). The J. Grotto Series presents itself very nicely. The wrapper has a nice colorado red tint to it. It has has a slightly oily look to it. There are some visible veins, but I would not categorize it as toothy. Overall the cigar was packed very nicely. The band is impressive as well. It has a red, gold, black, and white color scheme. The band is highlighted by a large gold “J” in the center over a red background. Over the “J”, it says “Grotto Series” in white font. Adorning each side of the center of the band are white pillars. There are also gold coin designs to the far left and right. I went with my usual straight cut into the J. Grotto Series Gran Toro. After removing the cap, I commenced with the pre-light draw. The dry draw notes yielded a cedar flavor that had both sweet and spice qualities (thus a “sweet spice”). I considered the pre-light draw to be satisfactory, so it was on to toasting the foot of my J. Grotto Series cigar to see what the smoking experience would deliver. The one thing I noticed with the J. Grotto Series is that the flavor profile took a little while to evolve Once it did evolve, it held for the majority of the smoking experience. The initial flavors had a bolder cedar sweet spice than what was present on the pre-light draw. I also detected some notes of natural tobacco flavor and some unsweetened cherry notes. The flavors complemented each other nicely created a very good start. The sweetness developed into a caramel sweetness early on and the cedar notes became more of a cedar spice. These two notes remained in the forefront while the natural tobacco and cherry notes went to the background. Around the ten percent mark, the caramel sweetness dialed back. It became more present on the after-draw. Otherwise, the cedar, natural tobacco, and cherry notes held until the end. There was more spice on the finish, but it was not harsh. Overall a very good finish with a nub that was firm to the touch and cool in temperature. Overall, the burn and draw were good. They weren’t perfect, but they weren’t bad either. For the most part the J. Grotto Series required several touch-ups to burn straight, and the touch-ups did the trick. The ash had more of a black-ish color to it. I was recently told by someone to observe the ash of many cigars made at Raices Cubanas as they will often have a darker ash. This seemed to be the case with the J. Grotto. The color of the ash wasn’t ideal, but it was tight and firm and didn’t have any adverse effects. The draw had a little more tightness than I like, but overall it didn’t turn into a struggle. The strength and body attributes complemented each other very nicely with neither attribute overshadowing the another. From a nicotine standpoint, the J. Grotto Series is going to fall directly in the medium strength category. As for the depth of the flavor notes, the J. Grotto Series is going deliver nicely here. I had it on the upper end of medium to full-bodied just falling a notch short of full-bodied. As I stated up front, the J. Grotto Series delivered some very nice early impressions. It definitely showcases that Honduran tobacco can make a very good cigar. Ocean State Cigars appears to be a brand to watch over the next few months. I would not hesitate recommending this cigar to a novice cigar enthusiast looking to cut their teeth on a medium strength, medium to full-bodied cigar. I’d also recommend this to an experienced cigar enthusiast – even those who are Dominican and/or Nicaraguan tobacco fans. Ocean State Cigars appears to be a brand to watch over the next few months and I look forward to seeing how they continue to progress and grow. samples were initiated by Ocean State Cigars in order to provide feedback.